If you want more from a salad than greens and dressing, these delicious vegetable salad recipes will more than hit the spot. When you hear the word “salad,” you probably picture a pile of lettuce with a few toppings like walnuts, cheese, and often a generous pour of dressing. It doesn’t have to be like that though: you can leave the lettuce at the store and still make a flavorful salad. Pick up a host of leafy greens and veggies from the farmers’ market, and you can make a special salad at home that will have you thinking gourmet – while filling up on wholesome nutrients. These five unique salads are perfect to bring to a summer picnic or potluck. They’re also easy to assemble for a light lunch or a side to go with a simple protein dinner like baked chicken, sautéed shrimp, or grilled fish. This recipe is a great way to use up the produce from your own garden. Any kind of diced tomato will do, and if you don’t have radish, toss in whatever fresh, crisp veggies you have on hand for texture. Something like celery or carrots will work just as well with the dressing, which features simple yet timeless flavors like tahini, lemon juice, and garlic. 1. After cutting the cucumber into pieces about 3/4” inch wide, transfer them to a colander, and place it in the sink. Sprinkle with salt, and toss the cucumber to ensure all pieces collect some salt. Set aside so the water can be pulled from the cucumber, draining for about a half hour. 2. Meanwhile, prepare the dressing. Use a fork to mix together the Greek yogurt, tahini, lemon juice, cumin, and Aleppo pepper in a small bowl. Taste the mixture, and add more cumin and a pinch of salt if you like. 3. With a paper towel, blot the cucumbers to remove excess moisture. Add them to a bowl with the halved tomatoes and sliced radishes, and slowly add dressing until the desired ratio is reached. You may use only half of the dressing and reserve the rest for another salad. 4. 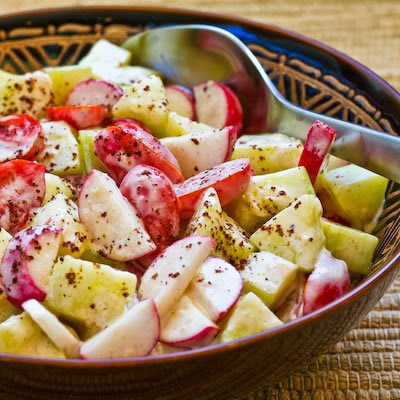 Garnish the salad with sumac, which adds a bright lemony finish, and serve immediately. This salad does contain spinach, so it doesn’t look entirely unusual compared to typical green salads. But the bulk of it is fruit, legumes, and the gluten-free grain quinoa. Add to that a dressing with raw apple cider vinegar – known to help you feel full faster and therefore eat less – and you have a delicious salad that supports a balanced diet. 1. 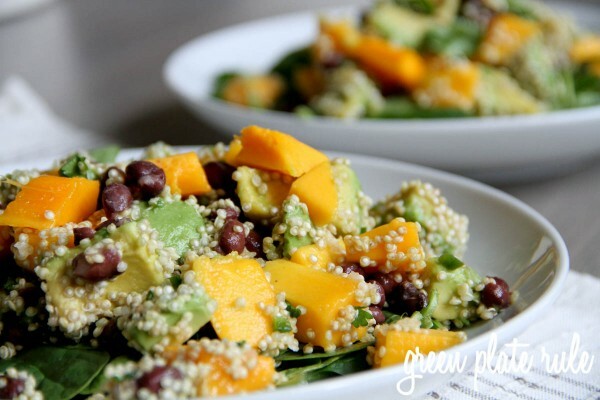 In a large bowl, add the avocado and 1 Tbsp. lime juice. Toss to coat, and then gently mix in the mango and red onion. 2. In a small bowl, mix the remaining lime juice, apple cider vinegar, cilantro, sea salt, and honey. Once combined, whisk as the olive oil is slowly poured in to finish the dressing. 3. Pour the dressing over the salad, and then add the black beans. Carefully toss to coat. 4. Divide the spinach and quinoa evenly between eight plates, and serve the salad on top. If you can’t stand Brussels sprouts, you probably haven’t had them prepared any way but over-steamed to mush. But as a crisp, crunchy cabbage, Brussels sprouts are wonderful in a salad. Here they’re mixed with other greens like parsley and escarole. And if you’re still afraid because of the flavor, don’t worry! With bacon and blue cheese in there, you’ll forget all about the sprouts. 1. To prep, rinse the Brussels sprouts in a bowl of water, shaking them underwater. Then cut them in half and slice very thin. Remove stems from the parsley before dicing the leaves, and then roughly chop the escarole into bite-size pieces. Peel and mince the shallot, and transfer it to a small bowl of sherry vinegar. 2. Chop the pecans into large pieces, and then add them to a dry skillet. Toast over medium-high heat for 2–3 minutes, stirring frequently. Once you can smell the pecans, quickly move them to a bowl. 3. Slice the bacon into small pieces. Wipe down the pan used to toast the nuts, and then cook the bacon over medium-high heat until crispy, about 5 minutes. Move the bacon bits onto a paper towel-lined plate to soak up the excess grease, but leave the rendered fat in the pan. 4. Season the chicken with salt and pepper on both sides. Reheat the bacon fat, and then add the chicken. Cook on each side for about 5 minutes, meaning it’ll be done in 8–12 minutes total. When finished, set aside on a plate, and let rest for at least 5 minutes. Slice into small pieces. 5. Add 2 Tbsp. of water to the hot pan, and use a wooden spoon to scrape what’s left from the browned chicken. Reduce the liquid for about a minute, and then pour into the bowl with the shallots and sherry vinegar. Season with salt and pepper, and while whisking, slowly pour in 2 Tbsp. olive oil. 6. Assemble the salad. 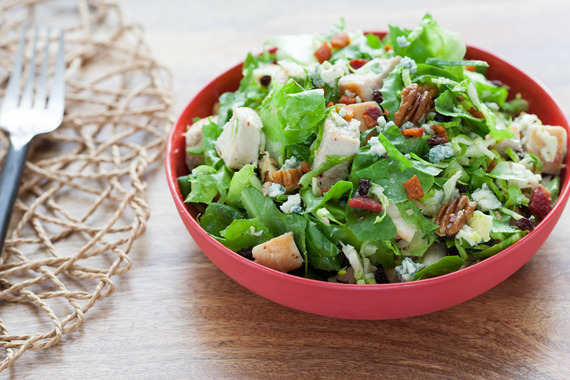 Combine chicken, escarole, blue cheese, Brussels sprouts, bacon, pecans, currants, and parsley. Add a quarter of the dressing at a time, keeping in mind you will likely not use it all. Divide the salad in two, and dig in. 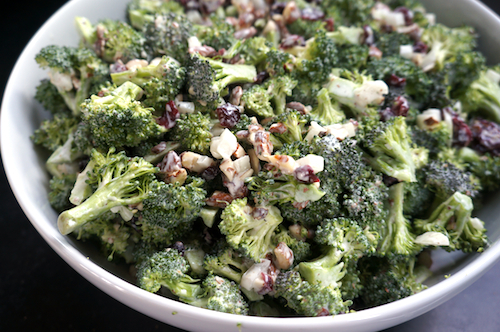 Even kids who don’t love broccoli can be tricked into trying this salad, which is dressed up with cranberries and almonds. But the real treat is the creamy yogurt dressing. Think of this like a lighter, healthier, better for you – and slightly sweet – version of a classic potato salad with panache. As long as you go for nonfat Greek yogurt, you can sneak in a little mayo to satisfy your cravings without going overboard on the calories. 1. Fill a small bowl with cool water, and soak the minced onion. 2. Wash the broccoli, and cut the top into small florets. Then peel the stem, slice along the diagonal, and then cut into matchsticks. Transfer the broccoli to a large mixing bowl, and set aside. 3. Make the dressing in a small bowl. Stir together the yogurt, mayo, vinegar, sugar, salt, and pepper. Pour it over the broccoli, add the onions, and fold the ingredients together. 4. Mix in the cranberries and toasted almonds, and stash it in the fridge until you’re ready to eat. It keeps well stored in a covered container. 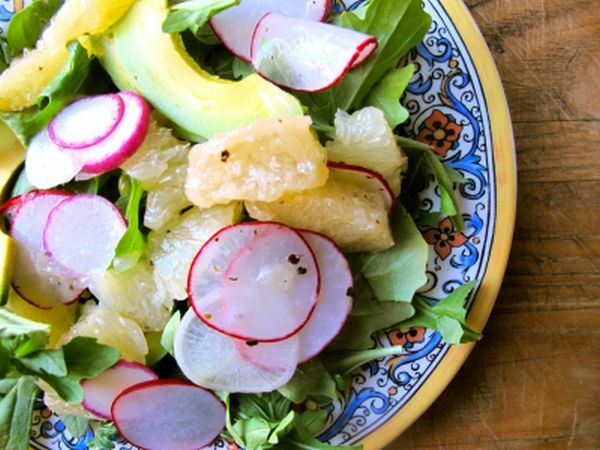 This salad sounds wacky, but after one taste you’ll realize it’s strangely wonderful. The rich and creamy avocado offsets the sharp, tangy grapefruit. And the radish adds a fresh, earthy element that brings it all together. It takes hardly any time to put this together, making it great morning, afternoon, or late at night. 1. To make the vinaigrette, combine olive oil, vinegar, shallots, and grapefruit juice. Add salt and pepper to taste. 2. Put the sliced grapefruit, avocado, and radish in a large bowl. Pour the dressing over the top, toss all together, and enjoy immediately. What did you think of these vegetable salad recipes? Have anything else to share? Let me know in the comments below!